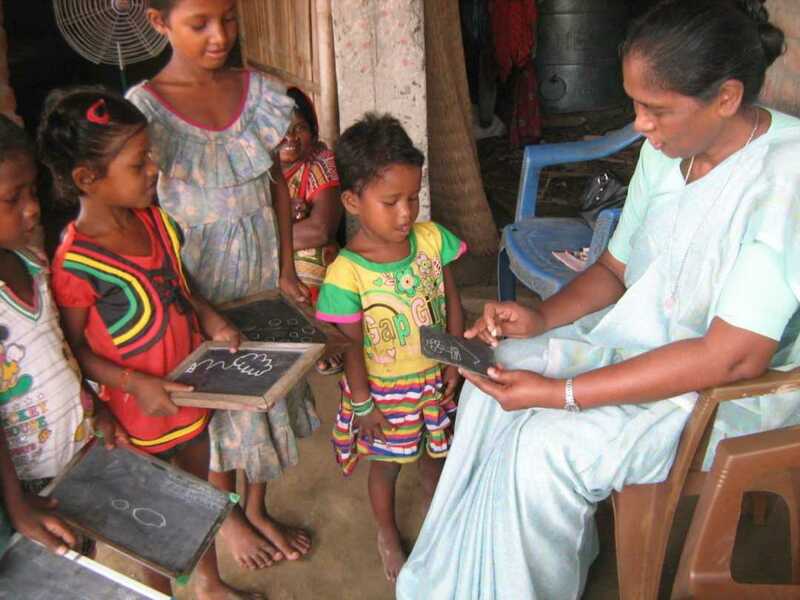 Basanti Lakra, SCN, provincial of Patna Province, visits a non-formal education center at Santhali Musahari Tola in Shapur, Bihar, India, on July 14, 2015. Here, around 25 children regularly attend classes. Some of them will go on to attend the government school after these non-formal classes. The intention of the non-formal education is to create an interest among children currently not enrolled in school and for their parents to enroll them. In India, “Mushars” or “Rishidevs” are educationally, economically and socially the lowest in the society. They are part of the Maha Dalit community. Dalits constitute nearly 15 percent of Bihar’s population of 83 million. The poorest Dalits are declared Maha Dalits in Bihar. Because of the constant motivational and educational programs and continuous contact of the Sisters of Charity of Nazareth, eight students from this group have been enrolled at the SCN Navjyoti School during this academic year. Sister Basanti was happy to interact with the students and to see their progress at the center. Young students were proud to show their hand writing and their creativity in drawing to Sister Basanti and to receive a “tick mark” from her. To encouraging the students, she distributed prizes for the best drawing and sweets for all.